A town with 20.000 inhabitants, it was built on a high tuff ridge overlooking the wonderful Gulf of Naples, and loved by poets and writers for its gardens and marvellous sunsets. It was here that Ulysses resisted the tempting chants of the mermaids, asking his crew to tie him to the mast of his ship while they had their hear sealed with wax. This is also the birth town of the poet Torquato Tasso, author of "Gerusalemme liberata" ("Jerusalem delivered") Although it is only a small town, Sorrento counts more than 100 hotels and it is the destination of more than 2 and half million visitors a year. As a matter of fact, it considered being a central place from where the most important places of the area can easily be reached by means of public transportation. 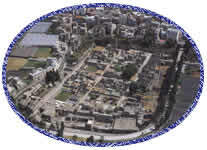 Sorrento is also renown as manufacturing place of inlayed woodworks and embroidery. 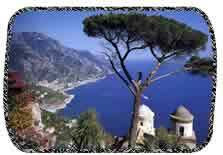 Amalfi Coast (Positano, Amalfi, Ravello). The Amalfi coast drive is an enchanting road that starts in Meta di Sorrento and ends in Salerno, after roughly 50 km and more than 1000 winding curves. Positano, suddenly appearing behind a headland, is the first village we encounter. Looking at it is like beholding a crib built on the rocks. Along the little roads and stairways of this village one can find the distinctive little clothing shops that make Positano's fashion world wide renowned. A few kilometres after leaving Positano, we find Hotel S. Pietro, one of world's most exclusive places. From here it is possible to see Capri and the Faraglioni. Next we cross the small village of Praiano, with its centerpoint the church of S. Gennaro with its magnificent ceramic dome. A little further, right after the two fishermen villages of Marina di Praia and Furore we reach the Grotta dello Smeraldo (Emerald's Cave). There in the seabed, a ceramic crib has been placed. After 20 more minutes of traveling we arrive in Amalfi, where the majestic cathedral, built in the IX century and the Cloister of Paradise built in 1266 A.D. can be visited. 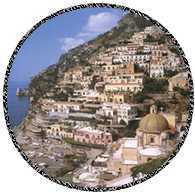 Side to side with Amalfi is the little town of Atrani, considered to be among the smallest towns in Italy. it is practically a balcony on the Gulf of Salerno. Villa Rufolo is the place where on May 26 1880 R. Wagner found his magic garden of Klingsor and the inspiration for the second act of the Parsifal. Villa Cimbrone, the other stunning villa of Ravello, is famous for its breathtaking panorama, which the American writer and honorary citizen Gore Vidal defined as the most beautiful in the world. In town there are a number of small restaurants where hand made pasta and dozens of other local specialties can be enjoyed. The local vine (without preservatives) and the homemade Limoncello (a typical lemon liquor) are among the local specialties. Pompeii was a 20.000 inhabitant strong city when it was completely buried in the ashes of the Vesuvius. The Vesuvius had been considered to be an extinct volcano for many centuries. Vineyards and luxurious houses covered its slopes when, on 24th August 79 A.D. at noon the volcano restarted its activity, exploding with a ferocious roar. Other "minor" archaeological sites such as Cuma, Baia, Bacoli, Miseno, Piscina Mirabilis, Pozzuoli, the solfatara volcano, the volcanic lakes of Lucrino, Fusaro, D'averno, Capo Miseno, the museum of Boscoreale, Stabia, etc are also worth a visit. These places, frequently visited by archaeologists, might represent an alternative for those who are already familiar with Pompeii and found of the archaeological sites. It is also possible to visit the Vesuvius' crater (1280 meters of altitude) and from there enjoy a marvellous view of the Gulf of Naples. Just as 2000 years ago the city of Herculaneum was destroyed because, like Pompeii, it was to close to the Vesuvius, nowadays it lacks somewhat appreciation because it is to close to the more famous Pompeii. As a matter of fact, Erakleion (that is its ancient name) has nothing to envy to her larger neighbour city. Although smaller (only a third the size of Pompeii), Herculaneum was the preferred place by the rich Romans and the nobles, who built here their sumptuous villas Oplonti is a marvellous out-of-town Villa, that is said to have belonged to Poppea, Nero's wife. This, however, has never been officially documented. 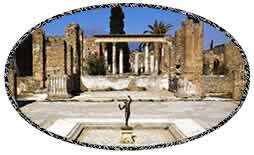 Very well kept and rich with frescos, Oplonti is only 2 kilometres far from Pompeii. In spite of its bad reputation, Naples is one of most beautiful and interesting cities in Italy. In its National Archaeological Museum it is possible to admire findings coming from Pompeii, Herculaneum, Stabia, Cuma, and other places of the region. The Royal Palace in Piazza Plebiscito houses exhibits of ancient furniture, paintings, sculptures, tapestry, frescos and porcelain from the 18th and 20th century. Also here is the National Library. Next to it we find the Royal Theatre of San Carlo and straight in front of it the gallery Umberto I. The royal palace at Capodimonte, houses a museum with an exposition of precious porcelains and also different art galleries. On the first floor one can admire in the historical apartments expositions of painters and sculptors from the Neapolitan school (18th century), while on the second floor paintings are exposed of famous artists like S. martini, S. Botticelli, Il Perugino. About 120 hectares of shady woods surrounds the palace. Here also resides the famous porcelain factory. In the Charterhouse of S. Martin, a 13th century monastery, there are yet more expositions of paintings, not to mention the marvellous cribs collection and a panoramic lookout. In the villa Pignatelli Cortes, one can admire the ancient royal carriages. 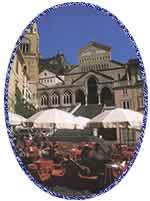 More than 100 are the churches that can be visited in Naples. Among those is the famous Church of S. Gennaro, where every year a miracle is performed: the liquefaction of the relic blood of the saint. Also worthwhile are: a visit to the monastery of S. Chiara, to S. Domenico Maggiore, the S. Severo chapel. 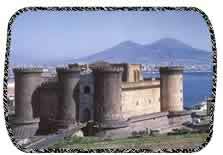 In Naples we also find many nice castles. The Maschio Angioino or Castel Nuovo, Castel dell'Ovo, Castel S. Elmo. Further there are marvellous fountains, roads, squares and catacombs of the "Subterranean Naples", not very well known, but extremely fascinating. The harbour near the maschio Angioino was built during the periods of great emigrations, and has become nowadays a mandatory stop for all cruise ships crossing the Mediterranean Sea. The promenade, from where the whole gulf of Naples with the Vesuvius, Sorrento and Capri can be viewed, stretches from Mergellina to the centre of the city for about 3 kilometres. In the squares we can enjoy the sfogliatella, the babà, or the pastiera, traditional Neapolitan sweets that everybody has in vain tried to imitate…first try and then trust! Paestum was built in the 46th century B.C. by settlers coming from Sibari, the Achei, who also had built the colony of Poseidonia on the estuary of the river Sele. Within one century the city developed so much that it became one of the most important harbours of the west Mediterranean sea. It was during that period that the three temples of Cerere, Hera and Neptune were built. These temples can still be seen today. After many misfortunes, the city fell pray of the Roman Empire and was renamed Paestum. The nearby museum houses findings coming from the city ad its surroundings. Also plates originating from the tomb of the diver from about 490 B.C. are kept there. These represent the only examples of murals from the Magna Graecia. Here you can taste the best buffalo mozzarella in the region and even see how it is made. 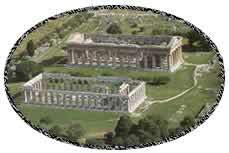 Velia was built in 540 B.C. on the estuary of the river Alento. Also Velia (or Elea) became an important harbour in the ancient days. Within the boundaries of the city protected by majestic walls and with splendidly well kept pavements, it is possible to admire the famous Porta Rosa with its lancet arch built in 350 B.C. that is considered the most ancient and better preserved example of Greek architecture. The building of the royal Palace of Caserta started by Luigi Vanvitelli during the second half of the 17th century (under the rule of Carlo III of Bourbon) was finished by Vanvitelli's son Carlo during the reign of Ferdinand IV. 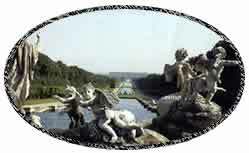 It is a majestic work that had to compete with the French Versailles. Five storeys on an area of 50.000 square meters, it has 1742 windows and 1200 rooms, a park that stretches for 120 hectares, with fountains and basins creating spectacular water plays and a waterfall 78 meters high. Remarkable is also the English garden with its 25 hectares of exotic plants and centuries old trees.